Arizona Resorts and Spa offers a unique vacation experience to visitors from all over the world. Why not enjoy comfortably, the natural splendor the desert can offer you? These will provide you with the scenery you are looking for. If you are looking for a romantic getaway, there are plenty of AZ resorts that can provide that as well. Let's Discover some Arizona Resorts! Boulders Resort Carefree Escape to a secluded haven amid the natural splendor of painted desert sand, towering cacti, and clear, blue sky - The Boulders Resort & Golden Door Spa is a popular Arizona resort in which to choose from. This luxury retreat truly inhabits a unique location from other exclusive Scottsdale resorts. Nestled in the Sonoran Desert - just outside Scottsdale, Arizona - our award-winning accommodations, world-renowned Golden Door Spa, and stunning natural beauty, create the setting for an unparalleled getaway. Francisco Grande Hotel Francisco Grande, the legendary Arizona golf resort, is located halfway between Phoenix and Tucson, and is just 45 minutes from the Phoenix airport and an hour drive from Scottsdale. The Francisco Grande Hotel & Golf Resort is an Arizona resort that offers its guests luxury accommodations in the Tower, superb food, outstanding golf, and excellent value. Carefree Resort and Villas Renovated in 2005, this air-conditioned hotel has a total of 465 rooms totaling over 2 floors. Amongst the hotel's facilities count a foyer with 24-hr reception, safe, a cloakroom and a lift. The Lariat Grill serves southwest cuisine and the Red Horse offers snacks and a full bar, as does the Buckhorn bar. The facilities also include a small supermarket, a conference room, a free of charge car park as well as room service and laundry services. Gold Canyon Golf Resort The Gold Canyon Golf Resort is a favorite of mine... Tucked away in a smaller community and breathtaking views, it is no wonder why so many love this course. This is one of the Arizona resorts that really does have everything everything you would expect from a finer resort. If you like quiet and plenty of wildlife, this is one of the many resorts in Arizona that gets my vote! I live just a few minutes away and I just love the area... the golf, the mountains, peacefulness, and all of the wildlife. Don't be surprised if you see some coyotes or roadrunners while on the course! I see them quite often. This resort has 85 unique Casitas that offer a variety of amenities such as Indoor or Outdoor Spas, Suites, Wood Burning Fireplaces, and Private Patios with splendid views of the majestic Superstition Mountains. Carved out of the foothills of the scenic Superstition Mountains, the 36 holes of Desert Mountain Golf at Gold Canyon offer two distinct playing options. Dinosaur Mountain, rated 4.5 stars by Golf Digest takes golfers into the high Sonoran Desert with dramatic tee-to-green elevation changes. Sidewinder, Four Star Rating by Golf Digest, runs through the lands natural arroyos and dry creek beds, providing a pristine desert golf experience. Canyon Plaza Resort Grand Canyon Escape to the grandeur of the Grand Canyon where sunlight dances on canyon walls and towering sandstone sculptures cast long shadows on the high desert. Located minutes from the south entrance of Grand Canyon National Park, guests at Canyon Plaza Resort Grand Canyon fully experience the magic of the Grand Canyon. Wyndham Canoa Ranch Resort Green Valley At the Wyndham Canoa Ranch Resort you'll gaze upon miles of verdant valley spread out before you, culminating in the breathtaking Santa Rita mountain range. This is an Arizona resort that is definitely worth mentioning... Mesquite, ocotillo and ironwood dot the unspoiled landscape, and Elephant Head Mountain rises toward a crystal clear sky. Havasu Dunes Resort Lake Havasu City If you prefer Arizona resorts that offer up some water sports, then consider The Havasu Dunes. These are desert villas situated across from beautiful Lake Havasu, near boating, fishing, and all other water sport activities. These luxurious condo style accommodations are perfect for a week vacation or for the entire season. Havasu Sands Resort Lake Havasu City Accessible to many local attractions. This Arizona resort has offers affordable and classic accommodations. It is also close in proximity to the business district. Great combination for business and pleasure. Located minutes from Main Street district. Located near by London Bridge. Hidden Palms Resort Lake Havasu City Located in the center of Lake Havasu, and just a short drive... if you are searching for Arizona resort that offer up some of the best water-skiing in the state, consider this hot spot. Other activities include jet-skiing, boating, bicycling, golf and tennis that Arizona has to offer. Hidden Palms Resort Condominiums in Lake Havasu City, is one of the preferred Arizona resorts for those who love staying active! This property is surrounded by the Sonoran Desert, the Mohave Desert, just 10 miles from the California border, and 150 miles from Las Vegas, Nevada. London Bridge Resort Lake Havasu City The London Bridge Resort is a fusion of English Tudor and contemporary design par excellence. It's one hundred and twenty two studio, one and two bedroom suites serve as an oasis for AZ resort guests seeking fun, excitement and tranquility amidst a truly remarkable setting. The attention to detail is stunning. 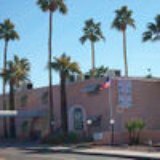 The Nautical Beachfront Resort Lake Havasu City The Nautical Inn resort is the only beach front property located in the state of Arizona. All rooms are located on the lake with spectacular views of the lake and mountains. Boaters enjoy the amenity of being able to leave their boats in the water outside the rooms and an adjacent 18 hole golf course makes it an attractive place to spend the Arizona resorts seasons. The Wigwam Golf Resort & Spa Litchfield Park The Wigwam Golf Resort & Spa recently celebrated its 80th anniversary as one of the Phoenix area's first full-services resorts. The Wigwam Golf Resort & Spa is an intimate retreat that blends casual elegance with the charm of authentic Arizona resorts. A one-of-a-kind resort destination with a spirit all its own, the Wigwam features 331 guest casitas including 72 suites crafted from traditional territorial adobe architecture surrounded by lush landscaped walkways, fragrant citrus tree-lined enclaves and floral and rose gardens. Arizona Golf Resort Mesa This hotel is located near well known landmarks like the Arizona Golf Resort and the Mesa Conference Center. Other nearby hotels include the Phoenix Zoo, the Sunsplash Water Park and the Goldfield Ghost Town. The Arizona Golf Resort Mesa is nearby many popular tourist sites. Bison Ranch Resort Suites Overgaard In the heart of Arizona's majestic White Mountains, the Bison Ranch Resort Suites combines the comfort and luxury of a resort hotel in the cool pines with the historic western culture of a time passed by. The Bison Ranch Resort Suites Hotel offers the unique combination of countryside wilderness, relaxation and recreation, with exceptional service and amenities, all just a short two hour scenic driver from Phoenix. 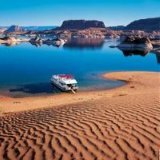 Lake Powell Resorts & Marinas Page Lake Powell Resort is located at Wahweap Marina in the heart of all your down-lake activities and adventures. Right on the lake, and just minutes from Page, AZ, Lake Powell Resort accommodates you with comfortable lodging, terrific dining and great shopping. This Arizona resort is your gateway to virtually unlimited land and water adventures and fun family activities. Whether it's a spectacular boat cruise, a great meal, a double cappuccino, or the hottest new wake-boarding gear, you'll find it at Lake Powell Resort. If you like water, this is a must on your Arizona resorts to do list! 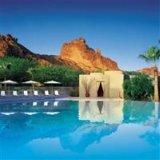 Sanctuary Camelback Mountain Resort Paradise Valley Situated on 53 acres, high above the valley, Sanctuary on Camelback Mountain recalls the era when the finest Arizona resorts were elegant and intimate. Sanctuary on Camelback Mountain offers its guests unparalleled privacy and peace. Every aspect of the property blends into the ageless mountain setting, yet guests enjoy the most modern of pleasures and conveniences. Sanctuary on Camelback Mountain provides a unique resort experience, offering stunning, panoramic views of the surrounding mountains and valley below. SmokeTree Resort & Bungalows Paradise Valley The SmokeTree Resort & Bungalows is a true Arizona resorts desert oasis. Five lush acres are home to 26 recently remodeled suites and bungalows. These individual private retreats offer luxury accommodations with all the modern amenities. Enjoy a workout or relax poolside in the manicured gardens. Cibola Vista Resort & Spa Peoria Offering the comforts of home combined with contemporary facilities, the Cibola Vista Resort and Spa at Phoenix brings you superb accommodation as well as personal service, thereby enabling you to have a pleasant and comfortable stay. The resort is located just 5 miles south of Lake Pleasant and is accessible in a 30-minute drive from the Phoenix Sky Harbor International Airport. Arizona Biltmore Resort Phoenix This Arizona resorts accommodation is found near the Phoenix Mountain Preserve. The Arizona Biltmore Resort Phoenix is set on 39 acres of lush gardens. It is also a short drive from many major attractions in the city like the Phoenix Zoo and the Desert Botanical Garden. Decor style is modern and tasteful. 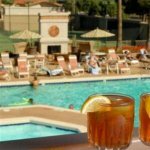 Arizona Grand Resort Phoenix This accommodation is found on 17,000 acres of mountain land. The Arizona Grand Resort Phoenix is right on the South Mountain Preserve, about five miles from the city center of Phoenix. It is less than one mile from the Arizona Mills Mall and is also one of the Arizona resorts with easy and quick access to the airport. Canyonview Resorts Club Phoenix Surrounded by unspoiled panoramas and teeming with a stunning variety of wildlife, this resort is a place of deep relaxation and natural beauty presenting tranquil setting and a little slice of paradise. Covering over 50 square miles of pristine Sonoran desert, the Canyonview Resort is a place gently cradled in the largest regional wilderness park preserve and is just minutes from downtown Phoenix. Premiere Vacation Club at the Roundhouse Resort Pinetop A mountain retreat featuring log-sided cabins surrounded by towering Ponderosa Pine trees. This invigorating, yet relaxing, natural setting features year-round recreation and seasonal activities nearby, including golf, skiing, fishing, sledding, hiking, mountain biking and horseback riding. Local restaurants abound with a wide variety of cuisine, while shops offer evrything from antiques to fishing tackle. Roundhouse Resort Pinetop With its central location, Roundhouse Resort is within easy reach of most tourist attractions and business addresses in Pinetop (AZ).The Roundhouse Resort boasts a convenient location with modern amenities in every guestroom and superb service. WorldMark Resorts Pinetop Those who live in Arizona year-round, appreciate the AZ resorts nestled in the higher elevations because of the cooler weather. The Resort at Pinetop offers condominium-style accommodations situated in the White Mountains, approximately 161 miles from Flagstaff Pulliam Airport.Hotel amenities include exercise room, outdoor children's pool, outdoor pool, tennis, game room, sport court, children's play area, and two outdoor spas.Guest condominiums feature TVs, VCRs, fully equipped kitchens. Prescott Resort The Prescott Resort & Conference Center is located 102 miles from Sky Harbor International Airport. Located just 90 miles northwest of Phoenix, the Prescott Resort is a great escape for a relaxing weekend, a family vacation, corporate meeting or retreat. Esplendor Resort at Rio Rico If there is one "perfect" Arizona destination, this is it - Esplendor Resort at Rio Rico. Perfect because of location, climate, superior amenities and service. Perfect for conferences, banquets and meetings. The resort retreat overlooks the lush green Santa Cruz River Valley. The views are endless, recreational amenities outstanding. Best Western Sundial Resort Scottsdale Stay at this contemporary boutique style hotel designed in the spirit of Frank Lloyd Wright in Scottsdale, Arizona hotel conveniently located close to key area attractions such as Scottsdale Fashion Square, Old Town Scottsdale and Camelback Mountain. Welcome to the Best Western Sundial Resort, a brand new hotel located in the heart of Old Town Scottsdale. Camelback Resort Scottsdale Scottsdale Camelback Resort is a paradise found in the foothills of the Camelback Mountains in Arizona. Guest can enjoy the comfort of the resort amenities, beautiful landscape, and the natural splendor of the Arizona desert. The Scottsdale Camelback Resort offers spacious villas, sparkling pools, well equipped fitness center, goofy golf, championship lighted tennis courts and meditation areas throughout the meticulously 11 acre property. Doubletree Paradise Valley Resort Scottsdale This hotel is found inside the Sonoran Desert and is on top of 22 acres of tropical garden area. The Doubletree Paradise Valley Resort Scottsdale is nearby the Scottsdale Fashion Square Mall. The Doubletree Paradise Valley Resort Scottsdale is just 12 miles from the Phoenix Sky Harbor International Airport. Fairmont Resort Scottsdale This Scottsdale hotel is located right around the McDowell Mountains. The Fairmont Resort Scottsdale is located downtown and is near many popular Scottsdale landmarks. The Cracker Jax Family Fun & Sports Park is just two miles away. The Fairmont Resort Scottsdale is near the airport and the center of the city. Firesky Resort Scottsdale This Arizona resorts hotel has a central location, right around top attractions and businesses in the area. The Firesky Resort Scottsdale is near the Old Town area as well as the many golf courses that characterize Scottsdale.